You’ve made the major decision to become a nurse. But that’s just the first step. Since there are several paths to nursing (the associate’s degree, bachelor’s degree and the lesser known diploma in nursing), you must explore your reasons for choosing nursing in order to select the right nursing program. The fact is that you’re more likely to succeed in the profession if you set specific goals. Though graduates of the ADN, BSN, and Diploma in Nursing programs are all eligible to take the NCLEX exam to become a Registered Nurse, there are key differences and advantages for each path. The associate degree in nursing is the most common option since it is the fastest and most affordable path to nursing. The diploma program is available at only a few reputable hospitals. The BSN requires a greater commitment of time and money, but it is the path chosen by those who have definitive goals for their career. If in the consideration of your goals, you find that you’re prepared to go all the way to graduate study or plan to apply for opportunities to lead after a few years of practice, then the BSN program would provide excellent value. No matter your chosen path, it’s a great time to become a registered nurse. According to the Bureau of Labor Statistics, there were 2.9 million registered nurses in 2016. Nurses make up the largest segment of the healthcare workforce. With a projected 15% increase in the workforce, there will be approximately 3.5 million nurses by 2026.Out of that number, the BLS identifies that the majority of the workforce would hold a bachelor’s degree. If you choose the BSN, you would certainly be in good company and be prepared to compete with new graduates as well as the thousands of nurses who are going back to school to obtain a BSN through the popular RN to BSN program. The AACN pointed out that students preparing for a professional discipline should secure a liberal arts education. The rationale is that those who complete a liberal arts course of study would develop skills in communication, scientific reasoning, analytics, and cultural sensitivity. The BSN program places more emphasis on the areas of science and humanities than the associate degree program. 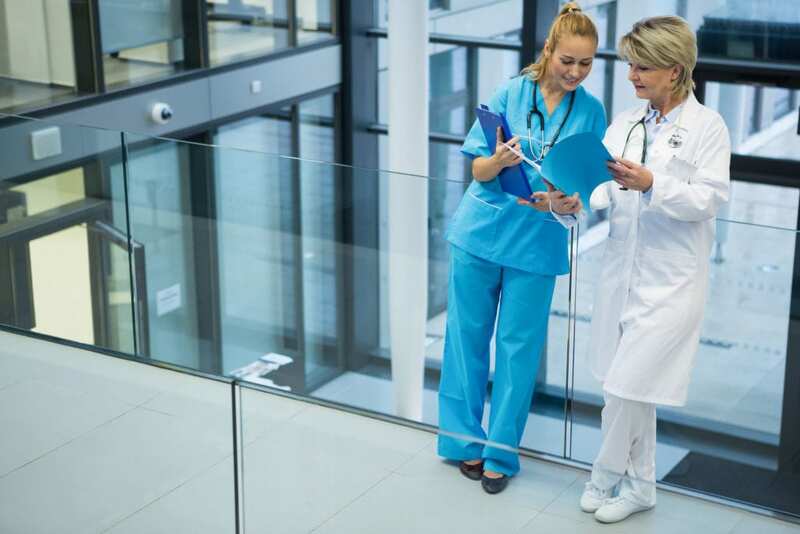 Nurses must draw from a broader base of knowledge, gained in their nursing education, to adapt to new healthcare technologies and the growing complexities of care. As the profession loses experienced nurses through retirement, the recommendation from the Institute of Medicine and other associations is that nurses have more education to fill the gap. Also, a shortage of physicians creates added responsibility for nurses who must be prepared to respond to a number of scenarios in care. A huge factor that reshapes the educational requirements for nurses is the volume of aging baby boomers with chronic and degenerative diseases. Nurses must have the educational preparation to manage these cases. Studies highlighting the influence of education on patient outcomes have influenced employers’ hiring practices. Approximately 82 percent of employers have a strong preference for nurses with a BSN. Magnet hospitals hire more BSNs and encourage their existing RNs to return to school to get the baccalaureate degree. As a result, these hospitals have recorded a 14 percent lower mortality and 12 percent lower failure to rescue rates than other non-Magnet hospitals. In the Future of Nursing report, the Institute of Medicine recommends that nurses earn a BSN. The changing health care environment calls for nurses are ready to manage more complex needs. BSN programs help prepare students to improve lives and promote health as they experience the personal and professionals rewards of nursing. LPN to BSN: Through the LPN to BSN program, licensed practical nurses have an opportunity to prepare for registered nursing by going directly to the BSN. This option will give them the best advantage as they combine the educational preparation of the BSN with their experience in nursing. The completion time is typically three years as students might receive credit for the entry-level nursing courses. The total number of credits transferred will be based on an evaluation of transcripts. Through classroom theory and clinical practicums, students will develop an understanding of advanced nursing concepts and be prepared to lead teams and manage care. Graduates will be eligible to apply for the NCLEX to practice as a registered nurse. RN to BSN: Registered nurses are returning to school to obtain a BSN in response to the repeated calls for increased nursing education and a competitive job market. Several industry reports show that the BSN workforce has grown from 42 percent to almost 67 percent in just a few years. Many states are on target for achieving the IOM’s goal of 80 percent. Those who plan to maintain their status must embrace continuous learning to get ahead. The RN-to-BSN builds on the associate degree curriculum but places greater emphasis on finance, evidence-based practice, diversity in healthcare, technology and informatics, leadership, and community and family practice. The theory is delivered in an online format so nurses can fulfill their educational goals without compromising their work and family commitments. Traditional BSN: The direct-entry BSN is targeted to those who may not have had any experience or education in nursing. The program will include classroom theory, laboratory simulations, and a supervised clinical experience to cover core nursing courses. Unlike the associate degree program, the BSN covers modules in community health, leadership, technology and informatics, evidence-based practice, communication and collaboration, and diversity in healthcare that will give students a decided edge in the workplace, especially when opportunities for management are available. Graduates may apply to the Mississippi Board of Nursing to sit the NCLEX for licensure as a registered nurse. The completion time for the BSN program is four years. Fast-track BSN: The fast-track BSN requires a full-time commitment. The curriculum takes adults who already hold a bachelor’s degree in a non-nursing discipline through the core theory and practical nursing courses in just 12 months. Nursing courses follow a sequential order and cover topics in community health, maternal child nursing, pediatrics, geriatrics, mental health, and medical-surgical nursing. BSN students are guided through liberal arts and science courses before commencing upper-division nursing courses in the final two years of study. General education courses in the first two years include math, history, English, anatomy and physiology, nutrition, and biology. After completing the general education courses, students may apply for direct admission to the Department of Nursing to complete the final two years of coursework, which includes theory and practical experiences in a simulated and real-world environment. Nursing courses include legal and ethical issues in practice, leadership, research, evidence-based practice, community health, nursing and assessment, professionalism, pediatrics, and women’s health. Students must complete a total of 128 credits to earn the BSN degree. The curriculum requires completion of 59 credits of non-nursing courses and 69 credit hours of upper division nursing courses. Graduates will be eligible, with approval from the Mississippi State Board of Nursing, to sit the NCLEX for licensure as a registered nurse. They will also have the foundational preparation for graduate study. A background check will be required for completing the clinical experience. A felony conviction may disqualify candidates from participating in the clinical experience. The second-degree or accelerated nursing program leads to a Bachelor of Science Degree in Nursing. The program is open to students who have already completed a first degree, so they’ll complete the requirements for a BSN in 3 to 4 semesters. In addition to any required prerequisite courses, students will also complete 60 hours of upper-division nursing courses. Prerequisite courses must be completed with a grade C or higher before the nursing courses. These courses include general psychology, chemistry, developmental psychology, microbiology, anatomy and physiology, statistics, and transition to health care professions. Core nursing courses include basic health assessment, interprofessional education, health and illness across lifespan, professional nursing role development, healthcare leadership and collaboration, and nursing capstone. Candidates must have a non-nursing baccalaureate degree from an accredited school. A criminal background check, health exam, and drug will be required for participation in the clinical practicum. To qualify for the full-time tuition rate, you must register for 12 or more credits each semester. The average for full-time tuition in Mississippi is $4,100 per semester. The flat rate allows for the completion of 12 or more credits and represents the best value for money. There may be an overload fee for completing 19 or more credits per semester. The total cost will depend on the starting point – based on the number of credits transferred in. Nursing students must be prepared to cover additional costs for uniform, fees, textbooks, transport to clinical sites, insurance, and supplies. Below you’ll find a list of BSN programs approved by the Mississippi Board of Nursing and their respective NCLEX-RN pass rates.